This is a tutorial on how to add and edit touchpoints via Bulk Upload. Adding touchpoints via bulk is quite easy. There are two main steps. Export and Import.The detailed steps for each follows. The column headers in the CSV spreadsheet need to be a perfect match to the field names in TPD when uploading touchpoints. You can manually create a CSV file using a spreadsheet editing software if you only have a few columns, or you can follow these steps to create a CSV Template. Create a blank project and rename all the columns and rows. Create your first blank touchpoint to serve as your guide. (Important: You will not be able to export to CSV if you have no touchpoints) . Follow the steps on how to export touchpoints to CSV format below. You can also create a template using an existing project by simply exporting that project's touchpoint. Open an existing project and click the Reports tab. 1 . 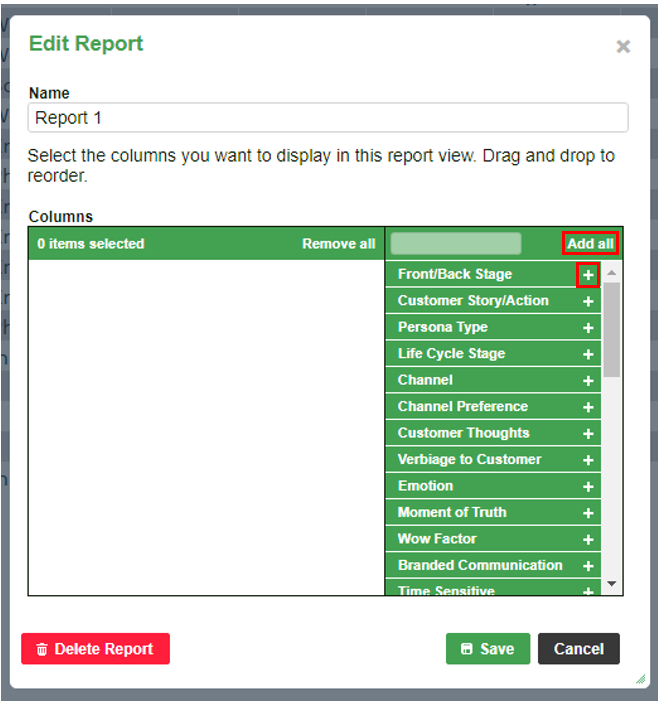 Click the Reports Tab and create a Report by clicking the 'Create a New Report' button. 2 . On the left panel, click 'Edit this Report'. 3. The popup below will appear. Add all columns you want to by clicking the '+' sign and click 'Save'. The report will automatically refresh. 3. Select all the touchpoints you want to export. 4. Click Import/Export icon and choose Export Selected Touchpoints as CSV file on your computer. You can use the CSV file as is or you can edit it to make any changes. Once you have finished editing the CSV file, you can import it back to Touchpoint Dashboard. To do this, follow the steps below. 1 . Open the project you want to import the CSV to and click the Reports tab. 2. Click the Import/Export icon and choose Import Touchpoints from CSV. 3. A popup window will appear. Click the Upload button to upload the CSV file to this project. Important: The column headers in the CSV spreadsheet need to be a perfect match to the field names in TPD when doing the upload. To preserve and import non-English and special characters to Touchpoint Dashboard, save the spreadsheet as CSV UTF-8 as seen below.